Get Well, Be Well, Stay Well Naturally! Reading this free ebook could improve not only your health, but everything else in your life! "Health is the result of thinking and acting in a Certain Way, and ... every person can attain perfect health." Already requested it, but it didn't show up in your email? Click here. "When I began actually to practice what he teaches —even imperfectly — the results were immediate and dramatic. After just one day ..." ... with a profoundly effective wellness system! "You'll be astounded by his insights and clarity ..."
Listen while you work or drive! "This is a double whammy — a passionate book read by an equally passionate Dr. Alexandra Gayek. Her personal insights brought it home for me ..." — Paul Dillon, Javabean Productions Get regular infusions of inspiration, practical tips, and amazing stories of others' successes with your free subscription. No filler, no fluff, always fresh! Are you a fan of The Science of Getting Rich? Hear Dr. Gayek explain how The Science of Being Well can boost your finances as well as your health! 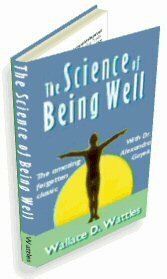 ... as Dr. Gayek guides you through using The Science of Being Well in real life. Join the hundreds who are waking up to a radically and permanently different experience of wellness. Are you ready to really BE WELL? Get personal help & coaching from Dr. Gayek. Join the global Q&A with like-minded people everywhere  and get all the newest announcements, too! Hand-picked tools & more, all in harmony with SOBW. Requested ebook but it didn't show up in your email? Click here! Get your free ebook & ezine here!